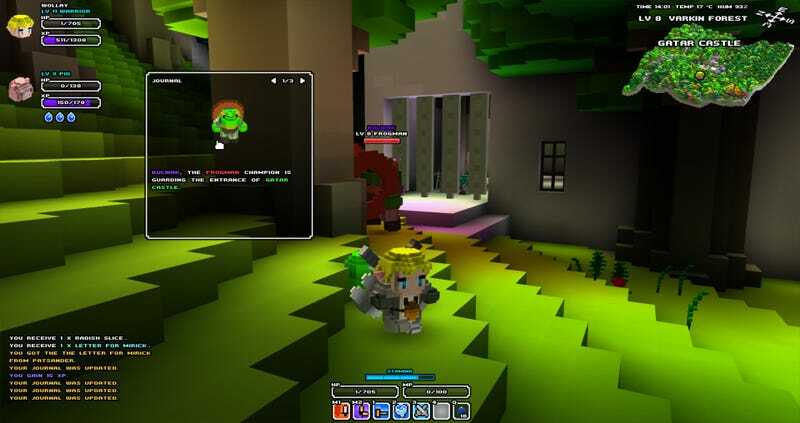 Though we initially heard a little about Cube World's questing system back in January, today the developers gave us a glimpse of how they would work in the gorgeous voxel-based RPG. There were some challenges due to Cube World's procedural generation: The world is generated on-the-fly in a small region around the player while he's exploring it, but we wanted to be able to define quests more globally. E.g. there should be quests that send you from one end of a land to the other. So I developed a system which allows me to create quests in areas that haven't been generated yet. Complicated, isn't it? ;) Also NPCs, monsters and items need to be generated before the actual landscape, so they can be logically linked to quests. We first started with an MMO-style quest system with quest-givers and many icons on the map, indicating quest locations, NPCs and so on. While it turned out to be a refreshing way to play Cube World, after a while we realized that it wasn't in line with the original Cube World feel: You felt forced to visit all those quest locations and to find quest-givers - there wasn't much reason to explore the world on your own. So we made the system more exploration-based: we removed quest-givers and also removed all markers from the world map. Quests are just there and players can find them by exploring. E.g. you might find an old crypt and when you enter it, there is a skeleton boss that you have to defeat. Maybe the boss will drop a key or a treasure which is needed for another quest. We added a quest journal with quest objectives and previews of creatures and items. The journal is updated automatically by fighting, finding items or talking to NPCs. Some NPCs give hints about quests that haven't been discovered yet. By removing all quest markers from the map, players are forced to study the world around them more actively rather than following an icon on the map. It makes finding the quest target part of the quest itself and leads to a much more immersive gameplay. Being an RPG, we want to make the quest system deep and inscrutable, so we're currently adding more quest variations, items and locations. Neat. You can read more about why we found Cube World exciting here.